Fireworks were set off during the Made in America festival, in front of the Philadelphia Museum of Art, in September 2017. On Monday, Jay-Z's entertainment company Roc Nation and the city of Philadelphia have reached an agreement that will keep the rapper and entrepreneur's Made in America festival at its original home, the Benjamin Franklin Parkway, in 2019 and beyond. Last week, the festival organizers said that, without their knowledge, the city planned to move the event after its 2018 edition to another location, away from the parkway. Since its 2012 founding, the festival has taken place in front of the iconic facade of the Philadelphia Museum of Art. 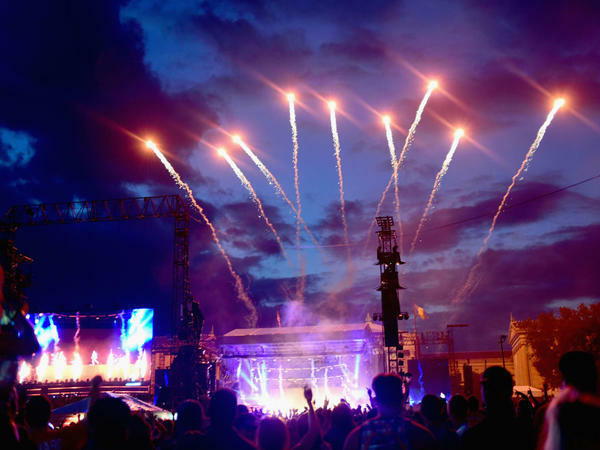 Roc Nation and Live Nation, the festival's producer, asserted that the companies had learned of the city's plans only after coverage on a local news site called Billy Penn. Tensions continued to build last Tuesday after a spokesperson for the mayor's office, Sarah Reyes, told the Philadelphia Inquirer, "When the festival first started, it was intended to provide a unique attraction to the city on the otherwise quiet Labor Day weekend. Over the years, tourism has grown overall, and the need for an event of this scale at this location may no longer be necessary." Numerous exchanges between the two sides played out in the media. Live Nation executive Omar Al-Joulani said that the city had "broke[n] up with us in the press." Jay-Z himself published a lengthy op-ed in the Inquirer, writing that the festival seemed "disposable now that we have served our purpose." To hail the new agreement, the city's mayor, Jim Kenney, released a statement in conjunction with Desiree Perez, the chief operating officer of Roc Nation. Kenney said, "I am greatly appreciative of everything that Made in America has done for the City of Philadelphia and I remain committed to its continued success. The Made in America festival belongs in Philadelphia – the birthplace of our country – and I'm optimistic that we can turn an unfortunate misunderstanding into a positive outcome and even stronger event. I look forward to working with Roc Nation and Live Nation, and maintaining this Philadelphia tradition for years to come." Perez said, "We are happy to announce the Made in America festival will continue at the heart of the Philadelphia, the Benjamin Franklin Parkway, for many years to come. After a candid and constructive discussion with the mayor, we are confident any miscommunication is corrected, and we are proactively addressing any concerns. We are committed to bringing the best experience possible to Philadelphians and all music lovers as well as the continuing prosperity of the city." Both sides pledge to address the "operational and community challenges" that come with a festival of this size, which in 2017 brought an estimated 130,000 attendees to the popular neighborhood. The 2018 festival will take place September 1 and 2; headliners include Nicki Minaj, Meek Mill, Diplo and Janelle Monáe.